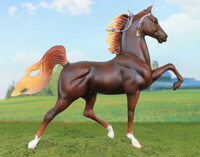 The divas of the show world, the Amercian Saddlebred is an elegant, long-necked, high-stepping horse, groomed to perfection and entering the ring with an artificially high-set tail. Some Saddlehorses are called 3-gaited, which means they perform the walk (show walk, not natural) trot and canter in the ring. The often most desired are the 5-gaited horses, which perform the three gaits, but add a "slow gait" and a "rack", which are cadenced, demanding and elevated. 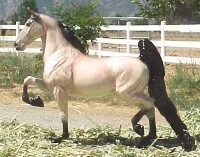 Saddlebreds are also frequently shown to cart, as driving horses. What this doesn't tell you, though, is that instead of being trained for show, the Saddlebred can also be trained to make a fine jumper, a sporthorse, a dressage mount or a trail horse. 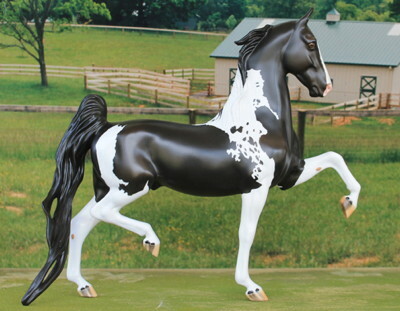 Saddlebreds come in almost all colors,including the dilutes and tobiano pinto, although not appaloosa spots, or any form of dun, and it is thought that roans have died out of the breed. 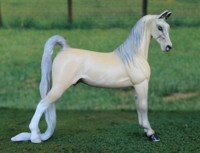 Some model roans have been bred forward from old roan Saddlebred stock. (Family Jewels [l] x Foxy Brown [l]- Chief Of Greystone) Sire by Grape Tree's Fox, out of a daughter of Vanity's Sensation of Crebilly. Dam is by a son of the great Wing Commander, out of Carol Trigg. Lines to CH Anacacho Shamrock, sire of CH Wing Commander, both top and bottom. OF Breyer 5 gaiter, top notch condition. Sire of Too Darn Hot, o/b Chris Wallbruch; Poconos Lalita, o/b Sherry Ball; Meadow Leaves, o/b Randa Garrett; winner Long Island Iced Tea and placed Red Zinger, his replacement, Spiked Tea and Sun Tea, all o/b PHF. (Irish American [l] x Rosie's High Color [bso]- Modern Creation [l]) Sire a Champion stallion by The Rambler, Bourbon Genius sire line. Starheart's Society, RWC Anacacho Dancer, WC Oman's Anacacho Rhythm, Anacacho Denmark, Veiled Prophet, Sensation Rex on dam's side. Sire of Poetic Enough, Emeralds and Rubies, Mile High Melody, Irish Eyes, Smokey Emerald. (Little Supreme Sensation [m-ls] x Shadow's Dream [live]-CH The Black Emerald) sire to Valley View Supreme, dam is double Wing Commander. 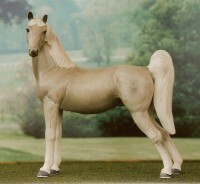 Breyer glossy palomino 5-gaiter, restored to perfection by Nan Wagner. CHAMPION, MEPSA 2001 Year-End International Reserve Champion ASB and Top Ten Discontinued Breyer. MEPSA 2002 Championship Top Ten ASB & Disc. Breyer. Sire of chocolate palomino, Solar Eclipse; his replacement, Sunshine Superman; and Golden Lustre, both o/b PHF. (IIS Tintinnabulation [m-b.kruger] x IIS Twist Of Fate [m-b.kruger]-Grape Tree's Fox [live]) 7/7. All lines to live. Sire is by The Silver Lining, by WGC Yorktown. Multiple lines to King's Genius and Edna May's King; Ace O'Goshen, Kalurama, Wing Commander. Sire of Nella Fantasia, 93, Multi-Champion, o/b Randa Garrett, Fortunate Twist, 96, o/b Vicki Griffith, Pewter Dust, o/b PHF, and Ironclad Command, Champion, o/b Laurel Dedes. (Captive Spirit [l] x Midnight Confession [m-phf]-OMA's Blue Moon) Captive Spirit is a World Grand Champion and a six time World Champion stallion; in hand as a weanling, and then in fine harness. Strong fine harness lines! Sire line goes to Stonewall's Golden Dream. Beside broodmare sire being a son of the popular Valley View Supreme, most of these lines are more unusual ones. Dam is on this list, with great lines to Special Assignment, Belle of the Dell, Wing Commander. Sire of Valentine Kisses; Society's Night Out; The Midnight Hour, o/b PHF; Midnight Heiress, o/b Diane Peter; PTR Midnight Miracle, o/b Jessica Bates; The Witching Hour, o/b Jean Whipple and After Midnight and Spanish Harlem Night, o/b PHF. (OMAs Blue Moon [m-oma] x Paramount Starlight Express [m-ff] -CH Paramount Irish Lad [m]) Sire was IPABRA 2005 Top Ten CM Saddlebreds and Live Show placed. Dam linebred to Wing Commander, also to Stonewall King. Lines to Special Assignment, My My, Belle of the Dell. Model lines from Chris (Semon) Wallbruch, Jennifer Raymond, Kim (Bjorgo) Thorne, Laura Behning, Janice Meixner. (Express Train [m-phf] x Midnight Confession [m-phf]- OMA'S Blue Moon) True old roan Saddlebred line brought forward through sire's dam. Traces all to real horses. Kalarama Rex, Spoonbill, American Ace, Conowingo's Grand, Sparkling Waters. Dam carries Naughty Verdict, My My, Special Assignment, Airman, Belle Of The Dell and Wing Commander, Anacacho Shamrock, Valley View Supreme and model lines. Sire of Blue Flame, o/b Ann Jone McGinnis and Champion, Ticket To Ride, o/b PHF. (Wild Assignment [m-phf] x Albemarle Supreme Vanity [m-phf]) Anacacho Denmark sire line through WC Broadland's Captain Denmark, also Special Assignment, King Barrymore, Bourbon King, Grand Stonewall. Dam to Genius Bourbon King through Valley View Supreme. Dam's sire is a WC son of Supreme Sultan. Supreme Sultan has one of the best producing female families. Also, Stonewall's Reveler, Lucky Kalarama. ceramic finished by Mary Miserak. multiple CHAMPION. Breed Champion, make Champion. Sire of Heirloom Silver, on this list and Sultan's Swing 'N Time, o/b A. Harpole. (CH. Heir To Champagne x Albemarle Supreme Vanity [m-phf]-Albearm Supremacy [l]) Sire is a Champion, by Champagne Fizz. Also Supreme Sultan and Stonewall King. 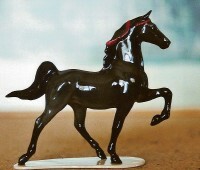 Breyer 2001 TRU SR 5-gaiter 'Valiant' OF. Sire of Flag Raiser, o/b PHF. (Flashpoint [m-woodl] ch tob x Brittania [m-woodl]-Buck Rogers [l] ) From Michelle Peck Williams' program, his sire, Flashpoint, is a NAN Top Ten and Reserve Champion Donna Chaney model. His dam has 100% live lines, a daughter of Buck Rogers. Sire of Champion Optimal Graffiti. (WBP Anticipation+ [m-c.wallbruch] x Golden Elegance [m-h.mays]- Flight Time Gold [l]) All lines to live. Hagen-Renaker Honora BHR SR palomino. Multiple Champion. 2005 IPABRA Top Ten OF Saddlebred Point Earner. 2007 Top Ten (2nd) point earner in OFHC, and Supreme Earner. (Frosty Irish [m-phf] x Harold's Notion [l]-Laetus Missouri Diamond) Replacment for his sire. Less used lines, no Wing Commander. Lines to Guided By Love through American Born, Bourbon King, Rex Peavine/Kalarama Rex, Silver Mac, Broodmare Hall Of Fame Abie's Baby, Lord Highland, Jean Val Jean, Bourbon Genius, Anacacho Shamrock (but not thru Wing Commander) Bobby Sea, Mark Twigg. Breyer 5 gaiter customized by Jason Ross, aka Nancy Strowger. (CH. Harvest Commander [live] x Starheart's Southern Lady [live]- Pat Pending) Sire is a Champion, by CH Sky Watch, and gets the palomino color from Bourbon Peavine of Belvedere. Dam has lines to CH Night Prowler, Hide-A-Ways Firefly Supreme, Starheart Peavine, Chief Beauchamp. Only one cross to Wing Commander. (Mr. Bojangles [m-k.fawcett] x We Can Make Believe [m-k.fawcett]- The Showboat®) Lines to CH Rick Rack, Private Contract, Status Symbol, CH Will Shriver. 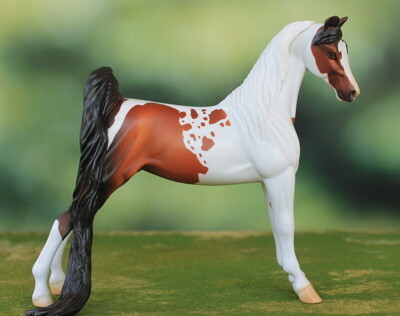 Breyer "Chubasco" clock horse OF. Multiple CHAMPION Breed and Make. 1st show: 1st of 42 Lefton, 1st of 14 ASB/TWH and Reserve Champion. 2nd show: 1st Lefton, Champion Lefton, 1st ASB/TWH. (Society Bourbon Cynsation [m-phf] x Ballet School [m-phf]- Wild Assignment [m-phf]) Old, less common lines. Kalarama Rex, Spoonbill, Leatherwood King, The Rambler, Rex McDonald, Special Assignment, Bourbon King. This stallion is the replacement for his sire at Persimmon Hill. 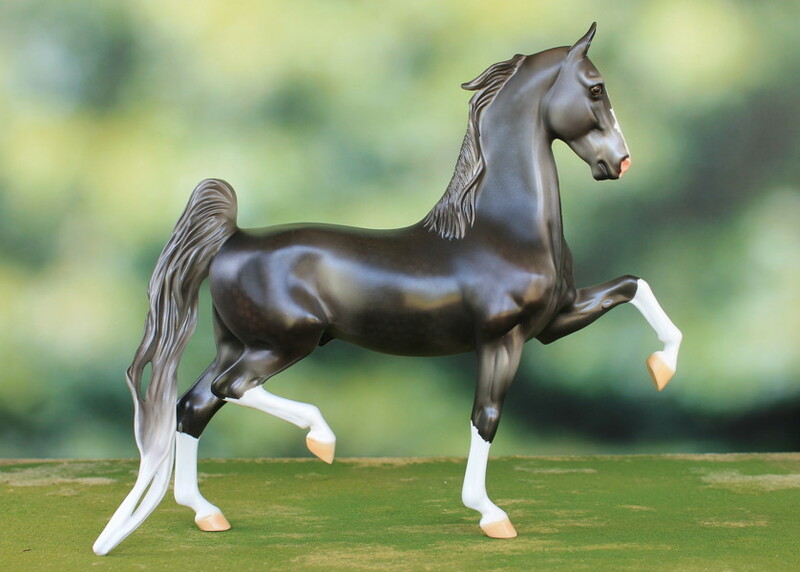 Breyer "clock horse" CM by Kathy McKenzie. (PT Beauregard [m-phf] x Ballet School [m-phf] - Wild Assignment [m-phf]) Ace O'Goshen sire line, also to Anacacho Denmark. Dam lines to The Rambler, by Genius Bourbon King. Also, Rex McDonald, Anacacho Denmark, Special Assignment, King Barrymore, Bourbon King and Grand Stonewall. (Tea Leaves [m-phf] x Champagne Mimosa [m-phf]- Champagne Fizz®) Lookalike sire is a MEPSA Champion. Sire line is Wing Commander through Grape Tree's Fox. Dam's sire is also by Wing Commander. Other lines to Vanity's Sensation of Crebilly, Kalarama Denmark, Winter Wine, Conowingo. Sire of Brandy Alexander, 06, o/b PHF. (Wild Assignment [m-phf] x CH Velvet Daybreak [l]- Attaches Liquid Asset) Only one line to Wing Commander, through dam. Dam is a Champion, and dam's paternal dam earned a Broodmare Hall Of Fame title. Other lines to WC Broadland's Captain Denmark, also Special Assignment, King Barrymore, Bourbon King, Starheart Stonewall, Sultans Great Day, Omans Desdemona Denmark. Winner's Choice micro mini OF. (Emerald Isle's Mile High [m-phf] x Ruby Slippers [m-phf]- The Red Rambler®) Old sire line, The Rambler, top and bottom. Also Valley View Supreme, American Born, Modern Creation, Starheart Stonewall, Veiled Prophet. No Wing Commander. 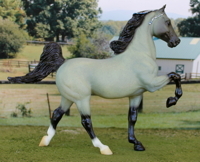 Breyer 96 SR #710396 JCP 'Gaited Breeds of America'. (Solar Eclipse [m-phf] x Long Island Iced Tea [m-phf]- Tea Leaves [m-phf]) Lines to Valley View Supreme, Wing Commander, Kalarama Rex, Spoonbill, Leatherwood King, Golden Cavalier, Moonspinner. (Tea Leaves [m-phf] x Foxfire Buckeye Strut [m-d.metcalf]- IIS Solsbury Hill [m-b.kruger]) Sire has lines to Grape Tree's Fox, Vanity's Sensation of Crebilly, and Anacacho Shamrock, sire of the great Wing Commander, top and bottom. Dam also to Grape Tree's Fox, and to Oman's Desdemona Denmark, Stonewall Supreme, Kourageous Kalu. (Spiked Tea [m-phf] x Copper Penny Moon [m-phf]- Supreme Assignment [m-phf]) Sire line is Wing Commander through Grape Tree's Fox. Wing Commander, Anacacho Denmark, Supremem Sultan, Valley View Supreme. Other lines to Vanity's Sensation of Crebilly, Kalarama Denmark, Winter Wine, Conowingo, Ensign's Dream, The Red Rambler, Lady Carrigan, Special Assignment, King Barrymore, Bourbon King, Grand Stonewall, Stonewall's Reveler, Lucky Kalarama. (Glynhill Tintype [m-phf] x Blaise O'Dawn [m-phf]- Blaise O'Callen®) WGC Yorktown/Wing Commander sire line. Also lines to Genuis Bourbon King, Stonewall Supreme, Rex Peavine, Valley View Supreme, Anacacho Denmark, Highland Born. Stone ASB "Franklin" OF 2012 Equine Affair SR.
MEPSA Reserve Champion, MEPSA 2014 Championship Top Ten in Breed and Manufacturer. 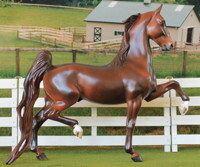 Stone Saddlebred "Spring Loaded" OF. Dam of Foxfire Pirate Treasure, 89, o/b Delana Metcalf; Solar Eclipse, '92, o/b PHF; Midnight Heiress, '94, o/b Diane Peter and Evening Roses, 00 o/b PHF. (Radiant Sultan [l] x Spring Status (bso)-Status Symbol [l]) The greats Supreme Sultan and Status Symbol, Anacacho Denmark, Stonewall Supreme. Dam of P.T. Beauregard, 88, o/b PHF; Ulysses, '89, o/b Alethea Drexler; Poetic Enough, 96, o/b Heather Mays; Midnight By Train, 97, o/b Melissa Blegan and Scarlett's Gypsy Emerald, 02, o/b PHF. (The Silver Lining [l] x Belle Of Jasper [l]- Supreme Sultan) Lines to Wing Commander, Ace O'Goshen, Bobby Sea, Valley View Supreme, Vanity’s Sensation of Crebilly, Bourbon Genius. Dam of Meadow Silver Satin, 89, o/b PHF; Nella Fantasia, 93, Multi-Champion, o/b Randa Garrett; Sultan's Swing 'N Time, 97, o/b Allison Harpole and her replacement, by How Fortunate®, 01, Fortune In Silver, o/b PHF. (Golden Symbol [m-bb] palo x Promise Me This [m-ff]) Line to models Worthy Choice and Explosive, Wing Society and Blue Boy, and to real horses Flashy Bourbon Peavine, Flight Time, Status Symbol, Anacacho Shamrock, Kalarama Rex. Dam of Jazzmaster Gold, '89, o/b PHF, Ribbons N Beaus, '90, o/b Rebel Meadow Ranch and Bahama Breeze, '91, o/b PHF. (Sultan's Great Day [l] black x Irish Silverrose Frost [m-ph]-Frosty Irish) By a World Champion, whose sire is Supreme Sultan. Lines to Stonewall Supreme and Denmark Beaverkettle through sire; dam was a Persimmon Hill brodmare. Dam of Long Island Iced Tea, 91, o/b PHF; Express Yourself, 92, o/b Chris Wallbruch and her herd replacement, Sterling Supreme Belle, 02, by Supreme Assignment, o/b PHF. (OMA's Blue Moon [m-oma] x Confidential Agent [m-ff]- Dream Merchant) Sire has lines to My My, Naughty Verdict, Special Assignment, Belle of the Dell and Wing Commander. Dam is by a Top Ten, ROM stallion. Most lines are real, a few model. Dam of After Midnight, 90, o/b PHF; Rimed Confession, 91, o/b Emily Leslie and Night Train, 92, o/b PHF. Part of name must be carried forward. 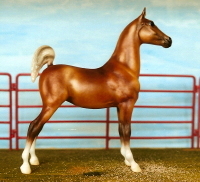 Breyer LB #1603 ASB OF. (Repeat After Me [m-c.nakagawa] x Show Me Off [m-c.nakagawa]- Show Me Too [l]) Society Rex sire line, also carries Private Contract, CH Wing Commander, Flirtation Walk. CH Will Shriver, Carol Trigg, 2x CH Valley View Supreme. SM custom by Michelle McKissack. 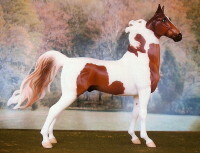 2005 IPABRA Top Ten CM Saddlebred Point Earner, MEPSA Championship Top Ten Saddlebred. Dam of Your Special Assignment, 91, o/b Randa Garrett. (Albelarm Supremacy [l] ch x Titleist's Vanity [m-rocknm]bay- Titleist) Sire line Genius Bourbon King through Valley View Supreme. Sire is a WC son of Supreme Sultan. Supreme Sultan has one of the best producing female families. Also, Stonewall's Reveler, Lucky Kalarama. Dam of Supreme Assignment, 92, and Independence Day, 93, both o/b Persimmon Hill. 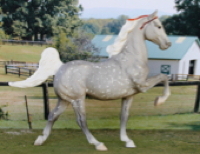 (Our Grey Dawn [®] x Platinum Ring [bso-lod]- Center Ring®) Sire is double Kalarama Rex. Dam's sire is a sabino chestnut, known for throwing a lot of white on offspring. Satin is a heterozygous grey, born chestnut with four high whites. Bred to chestnut, she can only produce chestnut, grey or chestnut sabino, but bred to a black-based color horse, she could produce bay, etc., too, with or without lots of chrome. Dam of Nights In White Satin, 92, o/b PHF and Moonlight Jive, 01, o/b Tina McDowell. (Cobra Command [m-ff] x Amber Light [m-oma]-Amber Flash) By Fleetwood Farms Multi-Champion, Top Ten, LOM, ROM palomino stallion. Dam is from Chris Wallbruch's program, has lines to OMA's Titlelist, Dance or Die and other model lines. Dam of CH. Saffron, 98, o/b Persimmon Hill, and Fleet's Narcisse, 00, o/b Tina McDowell. (Lord O'Shea [l] ch x Stonewall Silver Belle [m-phf] grey- The Silver Lining x Belle Of Jasper) Sire is a gorgeous sire of WCs. Sire line Anacacho Denmark through Oman's Desdemona Denmark. Also Stonewall King and Meadow Majesty. Dam is by The Silver Lining, and out of a Stonewall Starfire mare; lines to Stonewall Supreme and Anacacho Shamrock. Dam of Wildly Frosted, 94, o/b Mary Vinyard; Vogue, 95, o/b Chris Wallbruch and Snow Fire, 98, o/b Ryder Kair. (Blaise O'Callen [l] gr x Spring Training [l] ch -Epcot Center) Sire was never shown, but has good old producing lines. To Bourbon Genius, through Genuis Bourbon King. Also King Of Highland, Kalarama Rex. Dam has high white stockings, her lines include Supreme Sultan, Stonewall Supreme, Highland Born, Captain Courageous. Maternal family has produced WCs. Dam of Winter Moon, 96, o/b Beata Parsons and Flag Raiser, 97, o/b PHF. (Impressario [m-ff]x Society Silk [m-OMA]- Society Assignment) Damask is heavily model bred, by GR CH Impressario, who is by a CH. and out of a CH sired broodmare. Damask is out of a Wonka Spritz granddaughter. Also to OMA's Titleist, Dance or Die. Live lines to Victory Ace, Starheart Stonewall and Valley View Supreme. Dam of Dance With Me, '97, o/b Rockin M Ranch and Battenburg Lace, 98, o/b PHF. (P T Beauregard [m-phf] x Remember Topical Gale®- Chubasco) Ace O'Goshen sire line, also to Anacacho Denmark. Chubasco by Fountain Of Youth by Yorktown, out of PtHA Champion Tropical Gale from famous Scripps Miramar Ranch, by Ensign's Storm Warning to Edna May's King, out of Miss Stormy Weather by Anacacho Empire. Carries double Cameo Kirby. (Classic Memories [l] x Irish Silverrose Frost [m-ph]-Frosty Irish [m-lod] ) Sire's dam is a Champion. Lines to Genius Mountain Bourbon, Beau Le Rose Peavine, Frosty Highland. 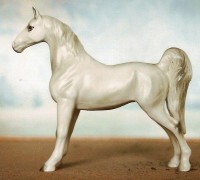 Breyer SM ASB Sears 98 SR.
Dam of Rose's Classic Tint, 2008, by Glynhill Tintype, o/b PHF. 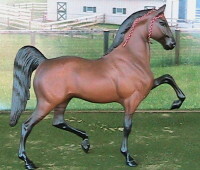 Sire's sire, Captive Spirit, is a World Grand Champion and a six time World Champion stallion; in hand as a weanling, and then in fine harness. Dam is a HoF Boodmare, as is dam's dam! Lines to Stonewalls Golden Dream, Valley View Supreme, Special Assignment, Belle of the Dell, Wing Commander, Supreme Sultan, Society Rex, American Ace, San Juan. 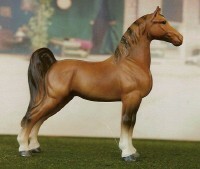 Breyer JAH SR SM ASB OF. Dam of Blue Flame, 99, o/b Ryder Kair. (Wild Assignment [m-phf] x Ruby Slippers [m-phf]) Both sire and dam on this list. The Rambler, by Genius Bourbon King. Also, Rex McDonald, Anacacho Denmark, Special Assignment, King Barrymore, Bourbon King and Grand Stonewall. Dam of Beau Dancer, 00, o/b PHF and Jazz Hands, 08, o/b Kay Myers. (Frosty Irish [m-phf] x PHF Damask [m-phf]- Impressario [m-j.raymond]) By a winner with old, HTF lines- twice to American Born. Dam has Fleetwood Farm and October Moon lines. 'A Quality Product' Japan china OF. (Glenknoll's MoreToSea x Golden Sea [m-phf]- Winsdown Black Gold®) Sire is minimal sabino, and in the pedigree of maximal sabino Beau Decision. Lines to Stonewall King, Kalarama Rex, Jean Val Jean, Bourbon Genius, Starhearts Stonewall, Kings Genius, American Ace, Ace O'Goshen and just one line to Wing Commander through Yorktown. Dam of Silveresced, 11, o/b PHF. (After Midnight [m-phf] x Castanet [m-phf] Harlem Globetrotter®) Sire's sire, Captive Spirit, is a World Grand Champion and a six time World Champion stallion; in hand as a weanling, and then in fine harness.Dam's sire is a famous WC, by New Yorker, Wing Commander sire line. Granddam is by BHR's Son of Wing Commander and out of Mary Sue Humphries' Starheart Stonewall mare. Hagen Renaker Show Special mini Honora OF. 2008/09 MEPSA winner. Winner. Multiple Reserve Champion. 2005 IPABRA Top Ten OF Saddlebred Point Earner. OFHC Supreme Earner and 2007 Top Ten (2nd) Saddlebred and Gaited mare. (Heir To Champagne [l] x Meadow Melody [m-phf]-King Of Magic®) Sire 2-Times World Grand Champion by Champagne Fizz. Lines to Valley View Supreme, Wing Commander, Sparkling Waters, Guided By Love, Anacacho Denmark and Meadow Princess. Custom SM NM ASB by Jaci Hibbert. (Society Bourbon Cynsation [m-phf] x Sunbeam's Fortune Cookie [m-phf]- Captain Fortune®) True roan line, from Judy Roan, dam bred by Julia Lord. (Jazzmaster Gold [m-phf] x Champagne Mimosa [m-phf]- Champagne Fizz®) Lines to Chubasco, Anacacho Denmark, Flashy Bourbon Peavine, Flight Time, Champagne Fizz, CH Winter Wine, Conowingo, Beau Gallant. (Key To Success [m-phf] x Winter's Op Art [m-phf]- Winter Carnival®) Sire has lines to Wing Commander, Flashy Bourbon Peavine, Status Symbol and Anacacho Empire. Dam to Winter Carnival and Modern Creation. 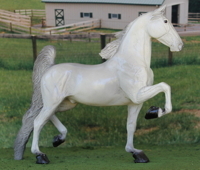 Multiple Winner, including 1st of 323 in Breyer, SM size. Dam of Georgian Grande, Jean Matisse, 13, o/b PHF. 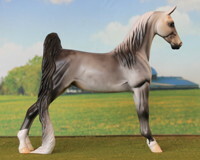 (Foxfire Heir Commander [m-d.metcalf] x Foxfire Mercedes Lady [m-d.metcalf]- SLM Firewind Supreme [m-s.feld]) Lines to Brett Kruger's IIS Tintinnabulation, live horses The Silver Lining, Kourageous Kalu, Supreme Sultan and Oman's Desdemona Denmark, and Chris Wallbruch's Wonka Spritz and Gazebo Dances. Stone FCM Pebbles 'Craig' 1 of 15 OF. (Silver Society [live] x Golden Sea Lustre [m-phf] Glenknoll's More To Sea®) Sire is a tested silver dapple, from Julia Lord, who found the silver gene in ASBs in her own live horse! Lines to Rick Rack, Wing Commander, and Veiled Prophet. Dam is a palomino sabino, with lines to Stonewall King, Kalarama Rex, Jean Val Jean, Bourbon Genius, Starhearts Stonewall, Kings Genius, American Ace, Ace O'Goshen and just one line to Wing Commander through Yorktown. Stone Pebbles ASB, CM by me, and painted by Karen Dietrich. Ohmygoodness Gracious 1987-2009 red roan ASB mare (Hayfield's Last Guy [l] ch x Blues Serenade [m-hr]- Courageous In Blue [l]) Hartland Saddlebred OF. Dam of Supreme Grace, 92, o/b Beata Parsons; Drops Of Jupiter, 93, o/b Chris Wallbruch; Goodnight Kiss, 94, o/b Karen Fawcett and Foxfire Center Stage, 97, o/b Delana Metcalf.